with these easy to swallow Bilberry tablets. of one of Bilberry’s greatest attributes – helping us to see clearly! 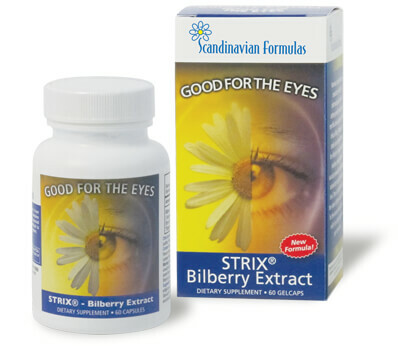 Scandinavian Formulas’ STRIX® Bilberry Extract contains Bilberry Extract obtained exclusively from Vaccinium Myrtillus L., specifically from the skin and pulp of the berry. Bilberry has been widely known to herbalists since the 16th century. This close relative of blueberries contains over 15 different naturally-occuring anthocyanosides (flavonoids) that contain beneficial antioxidant properties. "Life is Good – See it Clearly"
Other Ingredients: Gelatin, Glycerin, Purified Water, Yellow Beeswax, Caramel Liquid, Sunflower Seed Oil, Sunflower Lecithin. Intake: For adults, take one (1) softgel capsule once or twice daily, preferably with meals. Warning: If you are pregnant, nursing or taking any medications, consult your doctor before use. Discontinue use and consult your doctor if any adverse reactions occur. professional in the diagnosis and treatment of illness. © 2017 Scandinavian Formulas. All Rights Reserved.